Warm weather last week put a little color in the Arkansas River, but a cool weekend has damped it down and the water quality is very good. As of Sunday, flows were at 270 cfs in Granite and 450 cfs in Bighorn Sheep Canyon with over three feet of water clarity. The week ahead looks cooler, with a warming trend occurring toward the weekend. As a result, we expect continued good conditions through the weekend. The caddis hatch will continue its upstream movement and we will expect an emergence in the Browns Canyon/Ruby Mountain area by the weekend. Meanwhile, blue-winged olive mayfly hatches continue to be strong river wide. Crane flies in Bighorn Sheep Canyon remain a strong force in the morning. In the absence of surface activity, nymph rigs utilizing golden stoneflies have been productive in the mornings. Late in the day, dark streamers continue to move a lot of fish (Courtesy of ArkAnglers). Fishing for crappie and catfish is slow. A few saugeye are being caught by anglers fishing from boats using a variety of lures. Water levels are high and the water temperature is near 60 degrees. Trout fishing has been very slow from both shore and boat. A majority of anglers reported catching one trout or less. Anglers fishing from shore in the morning were more successful. Sherbet Power Bait or yellow Berkley's Floating Magnum Eggs typically work well for shore fishermen. Boat anglers caught a few trout in the morning on a gold and red Kastmaster. No fly fishermen reported trout taking dry flies off the water surface. Woolly buggers were the most productive pattern for fly anglers. Kokanee salmon and tiger musky fishing conditions have been very slow too. Surface water temperatures are around 40 degrees. The reservoir is closed to trailer motorized watercrafts on Tuesdays and Wednesdays. The current boating hours are from 7 a.m. to 5 p.m. Fishing for crappies and catfish is slow. A few wipers are being caught by anglers fishing from the shore. The reservoir is currently at 221,000 acre feet and the temperature is warming to about 55 degrees. We are still hearing about anglers catching white bass and small wipers on the north shore, mostly between the dam and the point. They are using white and yellow mister twisters and small rattle type lures. The water temperature is warmer south of the trestle, and the crappies are biting on minnows and flies. We still have not seen many walleye or saugeye being caught on the main reservoir or the stilling basin. Fishing at the stilling basin and Lake Hasty is slow. Some anglers at Lake Hasty report catching trout and largemouth bass on plastic worms. Fishing for all species is slow. Fishing is heating up on the big desert reservoir. Walleye are all the talk at this time of year. Fishermen are having success using a variety of methods. Jerk baits and crank baits will yield success, as well as jigs. Bass are also starting to show their faces after their winter slumber. Some bass are being caught on jerk baits and crank baits as well as plastics. Flows on the river below the dam have increased, as winter water storage has ended. Water is being released to make room for runoff, which is just around the corner. Fishing has been good on the river for trout. Even with the increase in release, flows are still relatively low and the river is still manageable for wading. Anglers are reporting success on blue winged olive and midge patterns. Both boat ramps are open at this time. Fishing has been fair for trout with people having the most success earlier and later in the day. The reservoir is currently experiencing extremely low water levels. 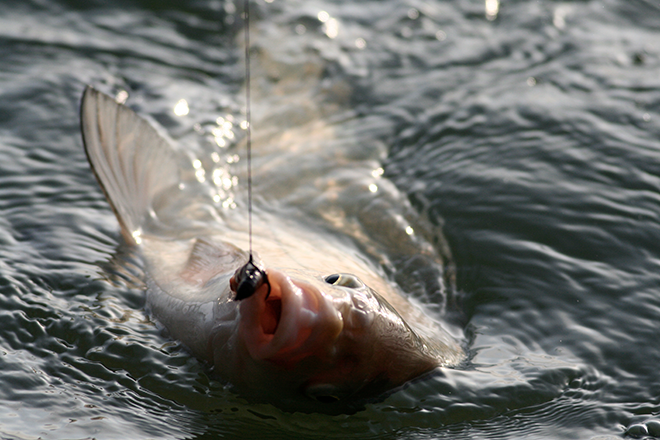 Fish survival is expected to be limited at this time due to poor water conditions. Water levels allow for launching boats from the south and north ramps. Stocking has continued, but will take a year or more for these fish to grow to a catchable size. Ponds 2 and 3 (the east ponds) are open to walk in access for the public. These ponds have been the most productive recently because they have been stocked for several years prior to open public fishing in order to establish the fishery. People are having luck catching catfish anywhere from 8 to 20 inches in length, with a few fish being even larger. Most of the catfish are caught using chicken liver. Smallmouth bass and crappies have been caught on all three ponds as the water temperatures continue to heat up.. Power Bait or various other lures seem to be the trick for catching trout. Increased water levels allow for launching boats from the west ramp, but the south ramp is completely under water and not accessible at this time. Stocking has continued with fingerling warm water species. It will take a year or more for these fish to grow to a catchable size. Boaters are urged to use caution as there is floating debris and unmarked obstacles on the lake. The surface water temperature is around 50 degrees. Shoreline anglers are still catching trout using Power Bait and homemade dough baits. The catfish are biting in Reilly Canyon on liver and night crawlers. Boaters are catching walleye in deeper water by trolling and using jigs. The trout continue to be caught by trolling. The moisture last week is helping the lake level rise quickly, causing floating debris on the water surface. We are starting to see some muddy water on the west end of the reservoir. Boaters are reminded that boats must be inspected prior to launch.